MIDI cable. Set the Input Ch. 2 knob to 10 and set OSC 1 to around 4. A 15 and C 15, I 12 and D 3. (MIDI-CV patch pic 1.1). Make sure that the EG repeat knob is set to 10 (off position). f.e. EG settings 0, 0, 0, 10, 0, 10. (Step 3) Now play/hold a bottom C (MIDI Note No. 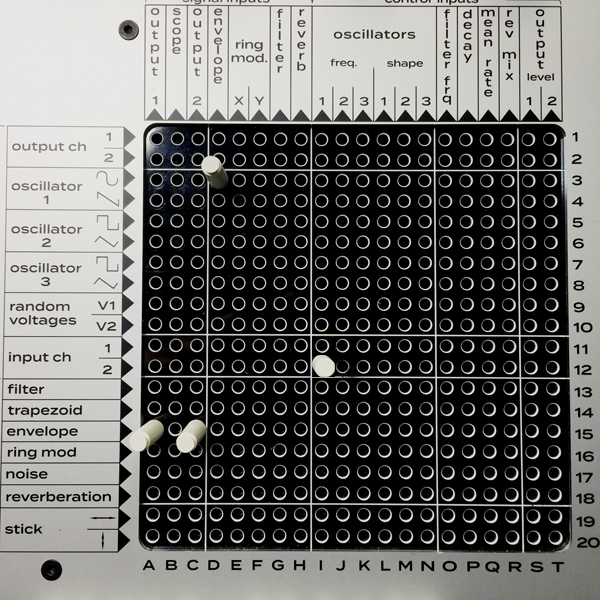 48, C3, 130Hz) on your DAW or keyboard and use another software-instrument or synth to tune the Portabella to bottom C. Adjust OSC 1 via vernier to bottom C.
(Step 4) Then play C an octave up and adjust Input Channel 2 for 1V/oct. Re-check on 2..3..4..5 octaves. Note. If you insert more pins to the matrix the Portabella may go out of tune because the matrix is not buffered. In this case you plain need to redo (Step 4) again. Send this file via DAW to the Midi Interface and repeat procedure above. jack cable to input Ch.1. Set the input Ch. 1 knob to 10. Set OSC 1 to around 4. A 15 and C 15, I 11 and D 3. (Ext. CV patch pic 1.2). (Step 4) Then play C an octave up and adjust Input Channel 1 for 1V/oct. Re-check on 2..3..4..5 octaves.